When travelling a lot you inevitably learn some pretty harsh lessons. The worst lesson I have ever learned was about vacation rental when I was scammed by a posting on a popular vacation rental website. I am not new to the web. I am in fact a trained lawyer. Still, I planned an entire trip based on a property that didn’t exist and was a victim of one of many vacation fraud rental scams. Well sort of. I’ll start at the beginning. When Will was two and Charlie a mere nine months, the winter came upon us quickly and we decided to head to South Florida for the month of January. We being, of course, me and the kids. I decided to use a popular vacation rental website to find a condo we could rent in an area I already knew. I did all the research that I could do from Toronto. I spoke to the condo owner on the phone. I looked at the condominium building’s website. I read the current comments and called three people who had left those comments to verify that they were real. In the end, I essentially got catfished by a condo. The day after Christmas we packed up the minivan and luckily my husband hopped in with us for the 30 hour ride from Sudbury, Ontario, where we were visiting family, to West Palm Beach, Florida. We traversed snow and ice, dealt with cranky kids and sleepless nights and in the end arrived in Fort Lauderdale to stay with a cousin of mine hopeful that the condo would provide us a few days of fun before my husband had to fly back to Toronto. On the morning of January 1st, we packed the kids and our expectations in the minivan and drove to West Palm beach. As soon as we approached the area we both knew something was wrong. The condo buildings seemed empty and signs advertising $199 a month rentals were everywhere. 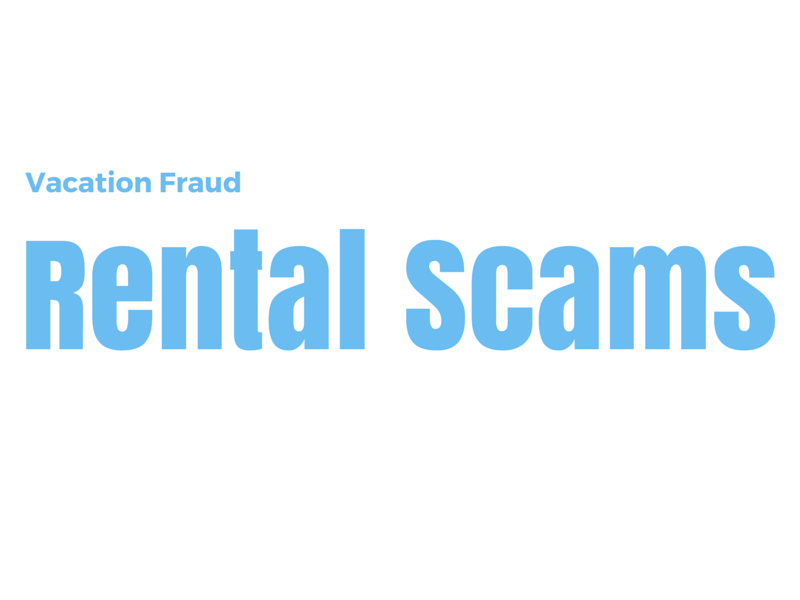 I tried to stay hopeful but in my gut knew that this was one of the dreaded vacation fraud rental scams. As we pulled into the address, I first noticed no-longer manicured lawns. The park I was so excited about had been torn down with only broken swings remaining. The three pools on the property had been drained. The condo corporation had gone broke and the condo I rented for almost $2000 with a substantial deposit was in fact a low priced rental in a neighbourhood that was quickly becoming known for its growing crime rate. Still, I got out of the car, found the condo and rang the bell. The woman opened the door but not the chain and told me the condo was not ready and wouldn’t be for a few days. I walked away wondering what I would tell my kids, husband, family and friends. The good news is that I am relatively quick on my feet and the disappointment was replaced immediately by my need to create a plan B. All we knew about the area was that we needed to leave and we drove back to Fort Lauderdale searching for a Starbucks knowing they would have free wi-fi and treats to appease the kids. Within approximately 4 hours we had our plan B. We luckily, through Craigslist, found a man who rented a number of condos in Fort Lauderdale and had two week vacancies in two of them. We had some issues getting certified checks from the American branch of our bank but within a few days we were settled in a very nice condo in downtown Fort Lauderdale. We moved to the second condo two weeks later which was directly on the beach and the lovely man even came and help me to move while luckily my cousin was able to babysit the kids. Look for clues. Is the price too good to be true (in this case it wasn’t), use the google maps streetview (not available at the time) and google the landlord’s name, address and phone number. In the end, the landlord of this condo had at least three names that I could find and the condo was posted on two reputable websites. I chased after her for our deposit for a few months and then gave up. I alerted the websites that she had listings on who got back to me to thank me for my report but took no responsibilities for the listings on their sites (which I knew when I rented the condo). In the end it was an expensive lesson made easier by the fact that I had a very welcoming cousin within an hour’s drive from the condo. We saved money on hotels by staying with her while sorting everything out. I have not since rented a vacation home privately. My in-laws actually run a lovely vacation home in France that is advertised on similar sites so I know these dream properties exist. If the situation were right, I might attempt it again. Just not in West Palm Beach. The memories would haunt me too much. So scary, disappointing, frustrating, infuriating all in one! I use Homeaway and Airbnb a lot and do worry about this type of thing but I usually only will book something with multiple reviews and I also use Google Streetview to check out the neighborhood. Not that that is current but it gives me some idea of what it is like. I’m glad it ended up working out for you. That is one of my biggest fears when we get a vacation rentals. I’m nervous right up to the moment we reach the home. So far we’ve only had one not so good experience but it wasn’t due to the house not being as advertised. I always check Google streetview, go with rentals that have many reviews.. Etc. But I also get travel/rental insurance (except that one bad experience rental. Which I still kick myself over). Many travel rentals insurance policies (from Homeway, or others like companies if offered) cover things like the property not being as expected, disputes with owners,recovery of deposit.. Etc. I’ve never rented outside of the US so I don’t know if that goes for other countries as well but at least it’s another way to cover yourself from potential scams. It doesn’t make things easier if you have been scammed but at the very least you’re not out all of the $$. How disappointing! I don’t know what else you could have done differently, really. It’s not like you didn’t check every angle to make sure it was legitimate. Could you have disputed the charge with your credit card and then let them handle it? One time I had a tour company cancel a tour on me but failed to refund my money in a timely manner. I disputed the charge with my credit card company, they refunded the charge immediately and then worked with the company to get their money back. That’s so crazy! I would have freaked and probably cried. Thanks for sharing, because I’ll be more cautious when renting private rental. We rent houses in Florida every year and thankfully that’s never happened. So sorry you all had to go through that! It’s great that you were able to come up with a quick backup plan. Thanks for sharing! I am so sorry to hear of your horrible experience! We’ve been using vacation rental for years and haven’t had a bad experience yet. I do hope we can still say that after this summer’s trip. We generally use homeaway, and once we used flipkey. We generally only rent places that have plenty of good reviews, though a couple of times we rented “brand new” properties and they worked out for us too. There’s a huge degree of trust involved when it comes to vacation rentals, on both sides. I’ve heard horror stories from property owners as well. But for us it’s still the preferable method of traveling, rather than cramming into one hotel room. I hope you’ll give it a try again some time. Yikes! Horrible lesson you had to learn and I thank you for sharing. I always suggest vacation rentals to traveling families and from now on, my recommendation will come with a warning.